VATICAN CITY (CNS) — Though she had always believed in miracles, Sharon Smith never dreamed she would be the recipient of one. Her unexplained recovery from a near fatal infection in 2005 was the second miracle that cleared the way for the Oct. 21 canonization of Blessed Marianne Cope. Smith will present Pope Benedict XVI a relic of Blessed Marianne — a bone fragment housed in a wooden tau cross, or T-shaped cross that is the symbol of St. Francis, the inspiration of Mother Marianne’s congregation. A native of Syracuse, N.Y., Smith fainted in her home one day in 2005 and woke up two months later in St. Joseph’s Hospital, her body perforated by tubes as doctors fought to keep her hydrated and alive. She had been diagnosed with pancreatitis, but the inflammation soon caused an infection so severe, it ate away part of her gastrointestinal tract. 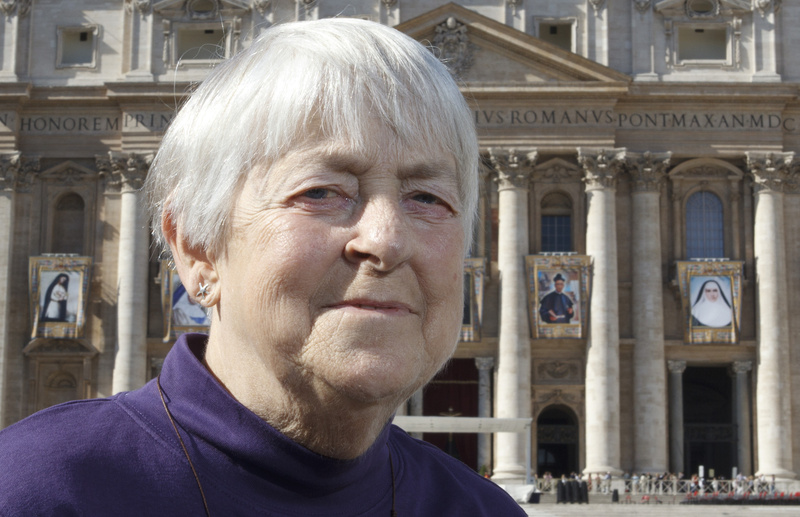 Her doctor told her that July, “Sharon, you’re not going to make it,” she told Catholic News Service in Rome Oct.19. 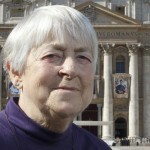 She and about 90 others from the Diocese of Syracuse, including Bishop Robert J. Cunningham, came to Rome for the canonization. Smith recalled that a friend visiting her at the hospital was given a prayer card of Mother Marianne and told to pray for her intercession. Mother Marianne had been beatified by Pope Benedict in May 2005. “My friends told me they prayed for me the night before they were going to just disconnect me” from the respirator, “and they prayed to Mother Marianne for me,” she said. The next day, “I woke up in the morning and started talking,” she said. Though she could breathe on her own, the infection was still severe. St. Francis Sister Michaeleen Cabral and other members of the community soon started praying for Blessed Marianne’s intercession. During one visit, Sister Michaeleen gave Smith, to pin to her hospital gown, a bag of soil that came from Blessed Marianne’s grave in Hawaii. Smith said she still has the packet of dirt, which she now keeps in her Bible. After nearly a year in the hospital and rehabilitation, Smith was given a clean bill of health and released. She said her doctor couldn’t believe she had recovered. Doctors said that places where tissue had died had actually healed and regenerated. Smith said she was so grateful for the prayers the sisters had offered her that she decided to “pay them back” by volunteering at a home for the terminally ill, which is run by the Sisters of St. Francis. “I figured I was alive for a reason,” she said. But Smith didn’t link her recovery to the prayers right away. It was only during her volunteer work at the hospice home that she unexpectedly ran into Sister Michaeleen and another woman who had visited her in the hospital. “They said, ‘Oh my God are you that woman that we saw dying?’ And I said, ‘Yes,’ I took it kind of lightly,” she recalled. But they urged her to go visit Sister Mary Laurence Hanley, who championed Mother Marianne’s cause for sainthood for nearly 40 years. The nun died in December 2011. “Like, I said, I believe in miracles, I just never thought I’d be one,” she said with a laugh.